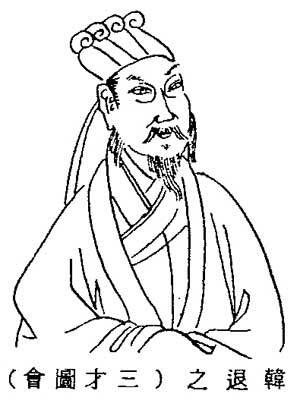 However, Han Yu is also credited with having written a set of 10 poems called Qin Cao (qin melodies; cao in ancient times often referred to laments). Because Taigu Yiyin groups pieces according to the person with whom the melody is associated, Han Yu's poems are not all together. Below they are listed according to their order in Han Yu's Qin Cao. At the end of each entry is the order in Taigu Yiyin (TG), the order in Cai Yong's Qin Cao (CY), then the page reference for the Zhonghua Shuju edition of Yuefu Shiji (they start on p. 839). Eight in Chongxiu Zhenchuan Qinpu (1585; search there for "Han Yu"). The 1539 settings seem to be unrelated musically to those in 1511, but those I have examined from 1585 (and its companion 1573), though different from 1511, still have a clear relationship. 44126.317 韓愈，字推之 Han Yu, style name Tuizhi, often called 昌黎 Changli because according to 14116.101 he was 封號 enfeoffed there (Changli is north of modern Tianjin in Hebei Provincel; Giles says Han Yu's ancestors were from there, though he was born in Henan); he was later canonized 文公 Wen'gong. 古文 Gu wen; 復古 fugu. See Stephen Owen, The Poetry of Meng Jiao and Han Yü. Translations of Han Yu are included in many collections, but I know of none with only his work. This image from Sancai Tuhui was copied from 44126.317 . 4. Charles Hartman in Nienhauser, Indiana Companion to Traditional Chinese Literature, p.388. 5. Harvard Journal of Asiatic Studies #57, p.53. Zha, Guide, 29/226/433: this melody was published in 1589 (QQQJ, VII, p. 73) and three later handbooks. It is set to the Han Yu poem 聽穎師彈琴 Listening to Reverend Ying Play the Qin (translation in Egan, Controversy, p.48). Reverend Ying was well-known as a qin player. I have written out transcriptions for all 10 settings but have only recorded a few (example). 8. The list of 12 cao can be found in Taiyin Daquanji. Qinyuan Yaolu gives introductions to each melody. Huai Ling has been written two ways: 壞陵(操) Ruined Mounds (Lament) and 懷陵操 Cherished Mounds Lament. For further details see the note with Qin Cao.